While no longer in production, the Leopard 46 is, in my humble opinion, a classic. I love her sleek lines, and having chartered one previously, I can say that I was very satisfied with her sailing ability. The galley has lots of space, and the forward facing Nav Station is great. The only negative is that the main halyard and reef lines are at the base of the mast, but I have found owners who have modified their boats to have all lines led aft, so I know it’s possible. Finding a quality used owners version may be a bit tricky, but could be well worth the wait. 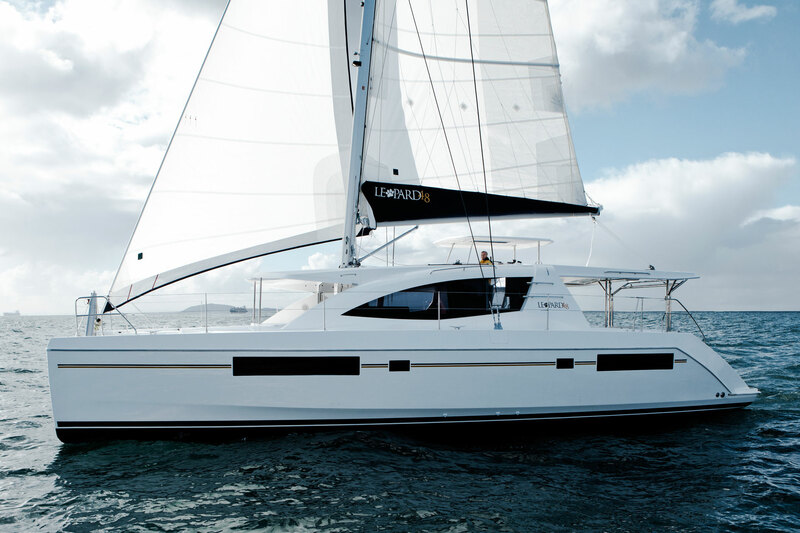 One of the newest Leopard models, the 48 won Cruising World’s Boat of the Year (2013) in the Best Full-Size Multihull category. She seems to take the best of the previous generation 46 and the new generation 44 and combine it into one boat. She’s got an interior Nav Station, the protected helm with all lines led aft, and the new unique forward seating area that Leopard has introduced with access from inside the saloon. At 48 feet, she still has enough size for a large trampoline, but she’s approaching the higher end of the size of boat we want. Her size plus her newness may make her quite expensive. The little sister to the 48 that started Leopard’s current design trend, the 44 is smaller than her name would suggest with a LOA of only 42.58 feet. She seems a bit compacted with a smaller trampoline and with the door up to the front sitting area, she doesn’t have room for an interior Nav Table. However, she does meet all of our other requirements and we both like the quality and general layout of the Leopards, so we’ll be giving her a close look. Introduced at last years Annapolis boat show, the name “Helia” is derived from the Greek term for ‘ray of light’ and in looking at pictures of this boat, it’s obvious a lot of thought was given to the interior spaces and the views generated of the outside world. I like the lounge deck and it’s location adjacent to the helm so that the Admiral could lounge while I sail the boat. Her numbers indicate she should be a decent performer on the water, and her layout appears quite luxurious. One thing I’m not quite sure about is the space between the helm and the winches/cleats which might make the boat a bit tougher to sail shorthanded. While not the best performer of the bunch, the Lagoon is renowned for her interior design and livability. And unlike the larger Lagoon models that have a flybridge, she has a raised helm that could be enclosed. Her interior space likely won’t be beat, but I’ve heard issues about Lagoon’s finish quality so that is something we’d be taking a close look at. These boats have also been in production for a while, which means we may be able to find a good deal on a used boat, but that also means the market for these boats when we return will likely be fairly saturated. This boat is a bit of a wild card. On paper she seems to check off most of what we’re looking for, but her raised helm design doesn’t seem as well thought out as the others as there is no way to enter directly from the cockpit. I’ve yet to see one in person, but the reviews I’ve read indicate the finishing quality is supposed to be excellent and she is supposed to perform quite well under sail. She is the boat I probably know the least about, which is perhaps why she intrigues me. This list is not an exhaustive one, not even close. Names like Schionning, Lightwave, Fusion, and FreeFlow all come to mind when I think about boats, but unfortunately they are all Aussies. And we are located very far away from Australia, which means it would be quite difficult to get a look at one. Antares is another well known name, but they are likely out of our price range. There may even be other boats by the manufacturers listed above that end up being exactly what we’re looking for. Window shopping these last few years has been a lot of fun and both the Admiral and I are excited about the boats that have made the short list. We’re heading to Annapolis later this week for the Annapolis Boat Show to take a closer look at some of our favorites and narrow down the list to find the boat that will be the right fit for us. We can’t wait!